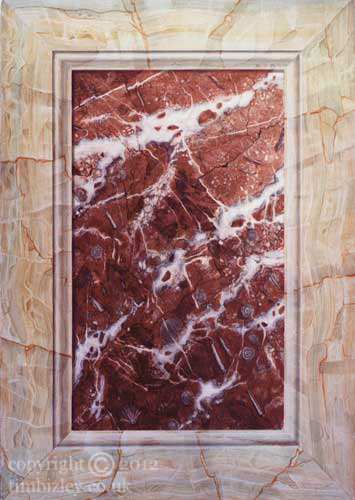 This trompe l'oeil panel depicts the faux marbling of Algerian Onyx on styles and rails and Rouge Royal on the inset panel. Rouge Royal is a Belgian marble characterized by flames of white calcite and is used extensively in furniture and decorations. Algerian Onyx is a highly decorative stone formed in a similar way to stalactites and stalagmites. This stone is usually quarried in relatively small sizes and is available in a large range of natural colours. Sometimes classified as a semi-precious stone this is one of the most challenging of marbles to represent using the traditional techniques of faux marbling. The highly transparent quality of Onyx represents a challenge to one of the main criteria of faux marbling, which is that of representing translucency with paint.